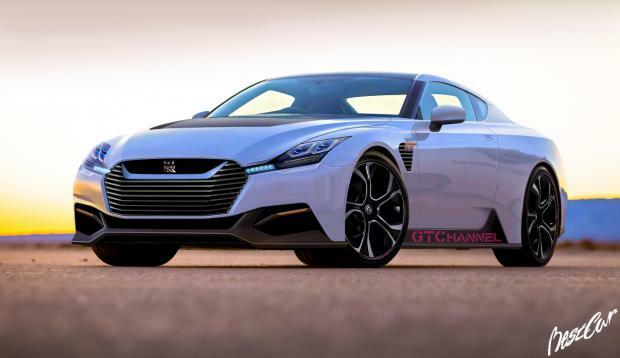 Our friends over at GT Channel have a pretty good line on Nissan and Nissan GT-R news. In this latest post, they throw out some speculation on the next model, the R36. Please don't let that picture above be correct. The horrible grill, the horrible wheels, and the Jaguar vent in the fender. Slab sided, no flares. Not GT-R like at all. They say there are two different possibilities. Do they want to follow the 911, the Audi R8 and build a more luxurious car that will fall in line price wise and performance wise with those cars, or something more hybrid and sporty? The NISMO version of the R35 GT-R will knocking on the door of 600 horsepower. Will the R36 go down a little in horsepower? The 2013 car is already 545 horsepower. A smaller displacement engine with electric assist for the front wheels is a possibility. This diagram doesn't show the front wheels being driven.